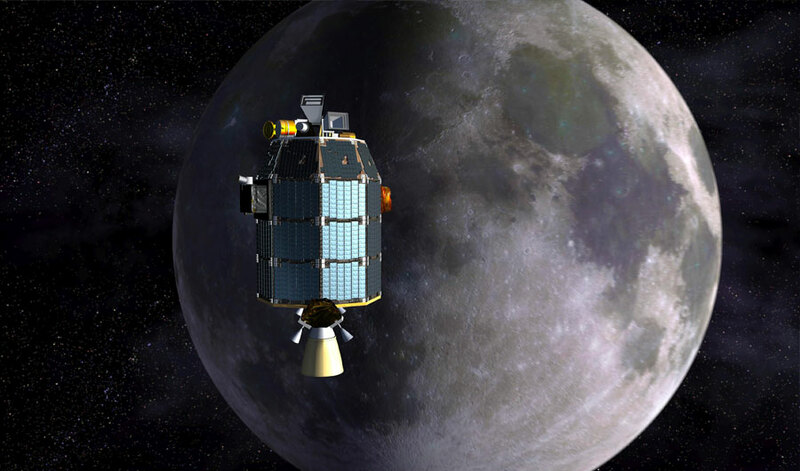 An artist's depiction of NASA's Lunar Atmosphere and Dust Environment Explorer (LADEE) observatory as it approaches lunar orbit. (Inside Science) -- Soil samples collected by astronauts on the Apollo missions suggested that the moon lacks water, except at the icy poles. But a new study indicates our gray, pockmarked lunar neighbor isn't completely bone-dry after all. It turns out that impacts by small meteoroids frequently propel dust as well as water droplets into the atmosphere, where a NASA spacecraft spotted them. Planetary scientists Mehdi Benna of the NASA Goddard Space Flight Center in Greenbelt, Maryland, Dana Hurley of the Johns Hopkins University Applied Physics Laboratory in Laurel, Maryland, and their team found the evidence of water with the Lunar Atmosphere and Dust Environment Explorer (LADEE). They found that 29 water releases between October 2013 and April 2014 coincided with when the moon was passing through known meteoroid streams. They published their findings today in the journal Nature Geoscience. “The moon is being pelted by tiny dust particles every day, and every once in a while, the moon flies through meteoroid streams when that bombardment is more intense,” Hurley said. They occasionally detected traces of water, and those detections often occurred at the same time the moon was passing through these streams. “That made us think we were witnessing water being released by the meteoroids,” she said. Their analysis shows that the water is hidden below a layer of about 8 centimeters of desiccated soil. But at water concentrations of no more than 0.05%, that subsoil could never be fertile ground -- it’s still drier than the driest desert on Earth, Hurley pointed out. The Trump administration aims to return astronauts to the moon’s surface by 2024, and these small amounts of water mean that in principle future missions could one day extract the water from the lunar soil for fuel and other purposes. But the water’s not sustainable. Astronomers believe it could have originated from an icy comet colliding with the moon hundreds of millions of years ago, and these findings show the moon could be losing as much as 200 tons of water per year. The meteoroid impacts could blast away the moon’s water -- at least until another comet collides with it. Editor's Note: This story was updated at 12:15 pm on April 18 to clarify the description of the number of water releases observed.